Today we went to our regular Monday afternoon playgroup and as always Ethan had a great time exploring all of the different toys. He's quite sweet, he'll go off and play on his own and then after a while he'll look up and notice me and come happily shouting and crawling back, often with something to show me. 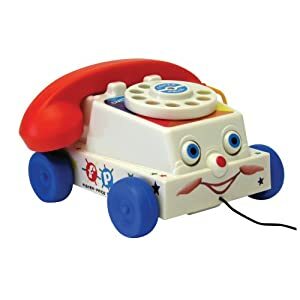 Today he discovered the very cool retro Fisher Price Phone, I think I had this phone when I was little (and I think that I may just have to buy him one now). Ethan loved playing with the phone, the cause and effect of the dial making a ringing sound when you turn it, pulling it along on the string, and of course, picking up the phone. At home he has realised that we put our mobile phones to our ears and talk, and after just showing him once with this phone he made the connection that it was the same thing. This is all part of his Knowledge and Understanding of the World, and it's facisnating to watch, it's like you can see him piecing it all together in his mind. He also connects it with the word 'Hello' which he doesn't yet say, but he does understand it and when we say it he then puts the phone to his ear. This is part of Communication, Language and Literacy (and hopefully he will begin to experiment with language more soon).